E gg laying hens are confined to cages know as “battery cages”. 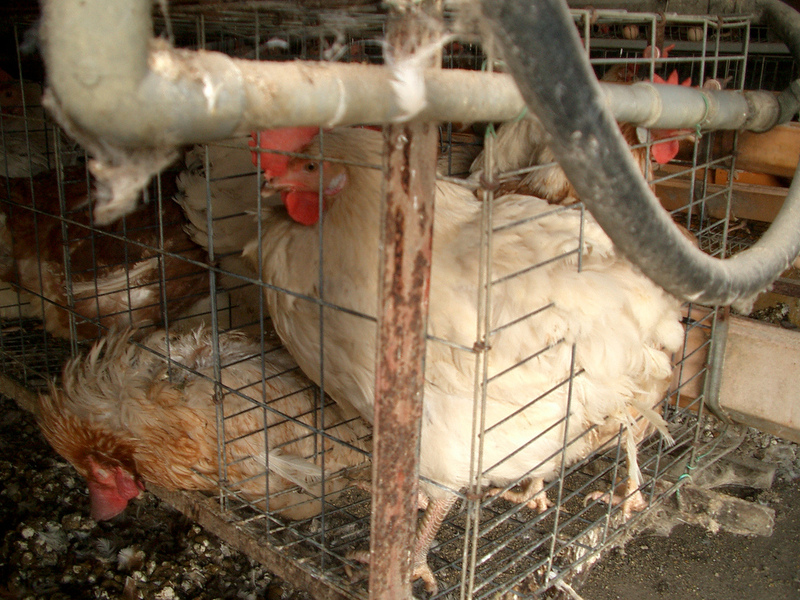 Several hens are often put into the same cage, where they commonly become injured, and even die due to overcrowding. The cages are placed at an angle of 8 degrees, so that any eggs laid, roll forwards for easy collection. In these cages, the hens are forced to stand on bare wire, which cuts into their feet, and causes terrible injuries. Their nails continue to grow inwards into their feet, causing pain and distress. Due to their cruelty, battery cages have already been banned in the whole of the EU (2012), in many USA States, and also in New Zealand, and Canada. However, in Japan more than 90% (one study put the figure as high as 98%) of egg-laying hens are confined to these cruel battery cages. Hens born in Japan suffer horrendously. If consumers don't raise their voices in protest, the battery cage system will not change. 2. Increase the number of free-range eggs available in their stores.